"The Nutmeg Children's Book Award encourages children in grades 4 - 6 to read quality literature and choose their favorite from a list of ten nominated titles. Jointly sponsored by the Connecticut Library Association and the Connecticut Educational Media Association." Nominated for "The Mark Twain Award" and the "Crown Book Award." Chosen by Bank Street College of Education for their list of BEST BOOKS PUBLISHED in 2004! "In this novel set in Newfoundland in 1929, 13-year-old Tom Campbell, an orphan, travels to Back o' the Moon Island to live with and work for Enoch and Fiona Murray. On his first fishing trip, he rescues a young Newfoundland dog from the sea during a storm and names him Thunder. A local boy, Bert Bosworth, and his father, Amos, also want the animal, and they go to great lengths to find his original owner out of spite. Thunder is a kind, intelligent creature who several times saves the islanders from danger. After a harrowing episode in which Amos shoots and slightly injures the Newfoundland while he tries to pull villagers away from a pending tidal wave, the Bosworths realize that the dog truly belongs with Tom. When Fiona needs help with a difficult birth, Tom and Thunder prove their courage by taking her across the ice by sled during a blizzard. The book concludes with Enoch and Fiona officially adopting Tom and with Thunder's original owner giving the dog to the boy and his new family. The episodic chapters are fast paced and the narrative creates a real sense of time and place. Tom's growing affection for the Murrays and his feelings about his pet are clearly delineated. Fans of Harlow's Star in the Storm (McElderry, 2000), dog lovers, and readers yearning for a cozy tale will enjoy curling up with this story. -Shawn Brommer, South Central Library System, Madison, WI "
It’s 1929 and thirteen-year-old Tom Campbell has always wanted a real family in a real house and a dog of his very own. Since he was three years old, the only home Tom has known in the Mission orphanage on the Northern Peninsula of Newfoundland. Now he’s being sent far away to live and work with fisherman Enoch Murray and his wife, Fiona, on Back o’ the Moon Island. So, Tom is amazed when, on his first time in the fishing boat and in the middle of a squall, he rescues a Newfoundland dog who seems to have come out of nowhere. Tom names the dog Thunder. With no one to claim him, the dog fast becomes Tom’s loyal and constant companion. When an earthquake strikes the area, Thunder proves himself invaluable to the family and the island, saving lives and warning of imminent danger – and it seems that Tom and Thunder might both have a place with the Murray family. But then Fiona becomes pregnant with her first child, and it looks like Thunder’s owner might be found. Tom’s wonderful, new world is being turned upside down. Will the Murrays still want Tom? And will Tom be forced to give up his beloved Thunder? 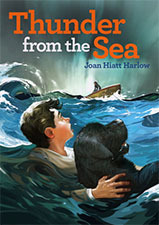 THUNDER FROM THE SEA is a thrilling adventure tale about family, loyalty, and the special bond between a lonely young boy and a remarkable dog. "If you loved STAR IN THE STORM, you’ll find THUNDER FROM THE SEA totally irresistible."